As for the prison drama genre, there aren’t many decent examples with notable exceptions being films like Brute Force (1947) and Cool Hand Luke (1967). One of the early excellent examples is Riot in Cell Block 11 (1954), a pulpy drama with a story ripped from the headlines. 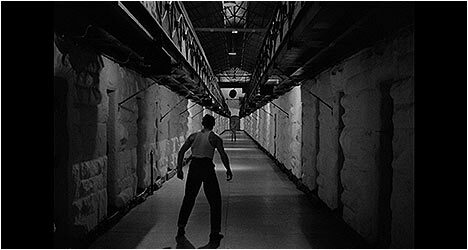 Directed by Don Siegel and partly inspired by producer Walter Wanger’s experiences in prison and a real-life riot that took place in Jackson, Michigan in 1952, the film takes an unflinching look at inmates’ rights (or lack thereof). In Siegel’s film, the prison is a ticking time bomb full of hardened criminals just waiting to go off if given the opportunity. Life in prison is Social Darwinism at its most primal. The violence that the inmates initiate isn’t mindless or random. Fed up with the brutality of the guards, the prisoners take them hostage in the hopes that their demands will be heard by the warden (Meyer). The riot is led by a ruthlessly cunning inmate known as Dunn (Brand) with the psychotic Carnie (Gordon) as his right-hand man. While the latter seems more interested in cracking some guards’ heads, the former is the man with the plan, conveying his fellow inmates’ demands to the authorities. Siegel utilizes his trademark no-nonsense approach to Riot in Cell Block 11 and this gives the film an almost-documentary look. It is pretty obvious who he sides with, but the director refuses to show all the guards as uniformly cruel much like he refuses to show all the prisoners as psychotic killers. There are good and bad on both sides of the cell door and Siegel never loses sight of the fact that most of these men have their own personal fears and desires. There is the Colonel (Osterloh), for example, a highly intelligent inmate who helps Dunn compose a list of demands, but won’t actively participate in the riot. Riot in Cell Block 11 is a powerful piece of pulpy socio-political commentary while also working as an exciting, two-fisted B-movie. There is an authenticity to the setting and the characters and this is aided by the production shooting on location in Fulsom Prison and utilizing several actual inmates and guards as extras. The film marked the beginning of a fantastic run of films for Siegel that continued next with Invasion of the Body Snatchers (1956), which also used its genre trappings to sneak in social commentary. This new Blu-Ray transfer of Riot in Cell Block 11 looks fantastic with filmic grain present and exquisite detail evident in every frame. Hard to believe this came out in the 1950s as it looks in pristine shape. There is an audio commentary by film scholar Matthew H. Bernstein. He provides plenty of production information while also expertly analyzing the film’s themes. He sheds light on the true-life events that inspired the film. Bernstein also provides brief biographical details on key crew members, like producer Walter Wanger, on this informative track. “Don Siegel on Riot in Cell Block 11” features the director’s son, Kristoffer Tabori reading the chapter on the film from his father’s autobiography A Siegel Film. It provides a look at the making of the film from Siegel’s point-of-view. “Excerpt from Don Siegel: Director.” Tabori reads a chapter on Riot in Cell Block 11 from Stuart Kaminsky’s 1974 book on Siegel. This extra provides additional production information. Finally, there is “The Challenge of Our Prisons.” This consists of excerpts from Peg and Walter McGraw’s NBC radio documentary series The Challenge of Our Prisons that originally aired in March 1953. This extra provides insight into the prison conditions that inspired Siegel’s film.